I have the new version 2 noise monitors ready. All the electronics are in an enclosure, making for a quicker and weather resistant setup. Read about Noise Monitor v2 here. 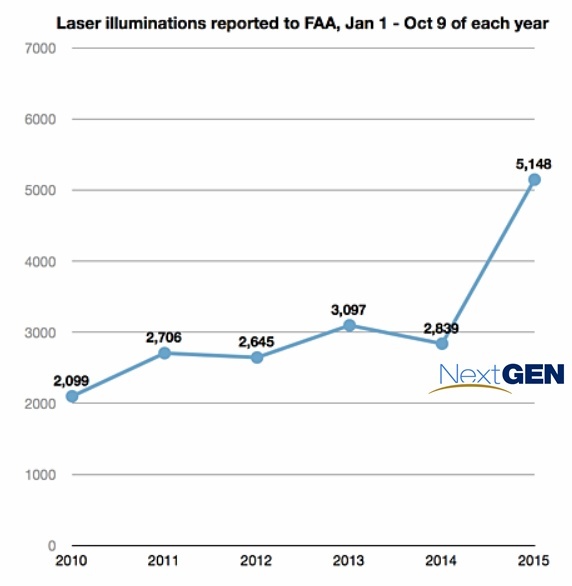 A disturbing sharply rising trend has been developing since 2014, the rise of people striking aircraft with lasers. It happens near airports and now it is happening on the low overflights brought on by the NextGen program. These strikes have risen by over 160% in the last year alone. Now more than ever, people in aircraft are in jeopardy because the FAA has brought people to the boiling point by forcing aircraft to fly low and loud. Lasing is a terrible thing to do. Those who do it are endangering innocents, but the primary fault lies with an uncaring agency, the FAA, who prioritizes airline profits over everyone's safety, whether in flight or on the ground. Reuters article on lasing incidents. USA Today article on the rise of lasing. I just added a new feature to the WEB site. 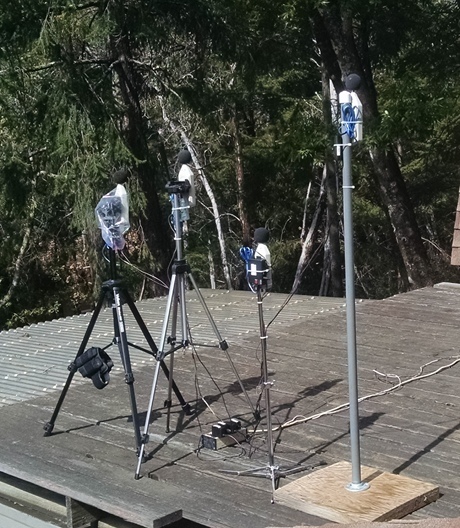 You can now see what the noise monitors are recording in real-time. With only a 10 second delay in the displayed data, you can now watch how the NextGen overflights affect the neighborhoods and rural communities. Each circle represents a noise monitor. The size of the circle increases as the noise gets louder. Click on the circle to see the exact A-weighted sound level. Click here to see the noise map. The second wave of deployment is underway, and now we have many more digital ears listening 24/7 to the noise inflicted on us by the FAA's misguided NextGen program. All this goes to congress, to advocacy groups, to lawyers, even to airports if they wish to help. It is not just Santa Cruz either. The build-out for citizen driven noise monitoring and action is happening nationwide. Finally, some congressional scrutiny. Congresswoman Eleanor Norton is pressing for a review of the noise abuse foisted onto us by the FAA. Contact your representatives and demand that they support her. Norton wrote: "There are reports from throughout the country of intolerable nighttime and early morning airplane noise in residential neighborhoods, much of it caused by new flight paths designed to implement NextGen…. Airplane noise has become a nationwide issue for many members of our Committee and many other Members. A congressional hearing at this time would help our Committee discover what FAA is doing to mitigate noise; whether NextGen, commercial airlines, or other factors are responsible for increased airplane noise; and what can be done about it." Though many aircraft are using NextGen point to point overflights, airports have a strong say on their scheduling because of operational considerations. Here we see that SFO enjoys the ability to perform tandem landings on their two parallel runways. They feed the right runway via over the San Francisco bay overflights and feed the left runway via SERFR1 routes as well as inbound northern and oceanic flights that angle in to join SERFR1. The result is a terrible din over the Santa Cruz ountains. The FAA received a 6 month funding appropriation without any constraints or direction (read story here. In this congressional meeting video, we see the stakeholders extol the reauthorization of the FAA funding, and demand the immediate, swift, and full implementation of NextGen. It's full steam ahead. It is all about new products and not a mention of community noise issues. The following video starts at the point of the discussion of the FAA modernization programs. With planes roaring as low as 100 feet over homes, residents in Chicago suburb sue. The familiar refrain from city officials to the affected residents was "...would not have a material impact upon their lives, property or neighborhoods". The number of flights "would not be significant..." More here in this Chicago Tribune story. The noise monitor build-out has begun. Greg and I have been testing them, trying different configurations, and we have settled on a simple free standing pole mount. The tripods are too easy to kick over, and they take up too much footprint. The unit to the right in the photo below is the design that will be deployed. The 1st wave will be 5 units. What happens next is I will contact everyone who expressed interest in a monitor. I will ask for your street address because we have in mind some locations where we want the first ones to be located (the summit area needs coverage). Once we select the first candidate locations we will schedule site visits. We will be looking for decent sky view, not too much ambient traffic noise, an outdoor electrical outlet that can be committed 24/7. We also will see if the unit can connect to your Wi-Fi network reliably. If it all works out we'll perform the set up, get it online and monitoring. Why build this monitor instead of buying existing systems? Yes, there are many sound/noise monitoring systems one can purchase, but they are quite pricey. Prices range from $4000 and up. Setting up a commercial system would be prohibitively expensive for municipalities let alone individuals. A 20 unit monitoring system would price out around $80,000 to $150,000. Recurring costs for central logging would be approximately $1400/month for the network plus another $300/month for the database support. That does not include personnel costs. The meter, logger, and power adapter is priced (and costs) approximately $165. A 100 foot 16/3 outdoor extension cord costs around $18 (Home Depot). A camera tripod can be obtained for $20-$25 (Best Buy, Amazon). A volunteer is working on making an anchored unipod for under $10. The noise monitor measures sound levels in the area where it is located. With the given meter, it measures sound levels from 30dB to 130dB. Can it hear what we are saying and does it send that to the servers? The data streaming from the USB port are strictly sound levels. No audio is sent to the logger so your privacy is ensured. Conceptually, the meter is a microphone but it has a separate jack to pass audio. This is not used in this version of the noise monitor. There may be a time when we might need to collect the acoustic signature of the over flights, but those systems would have to deploy with your permission, and frankly, it would be only on a spot basis anyway. The full audio is not required to meet the goals of this project. 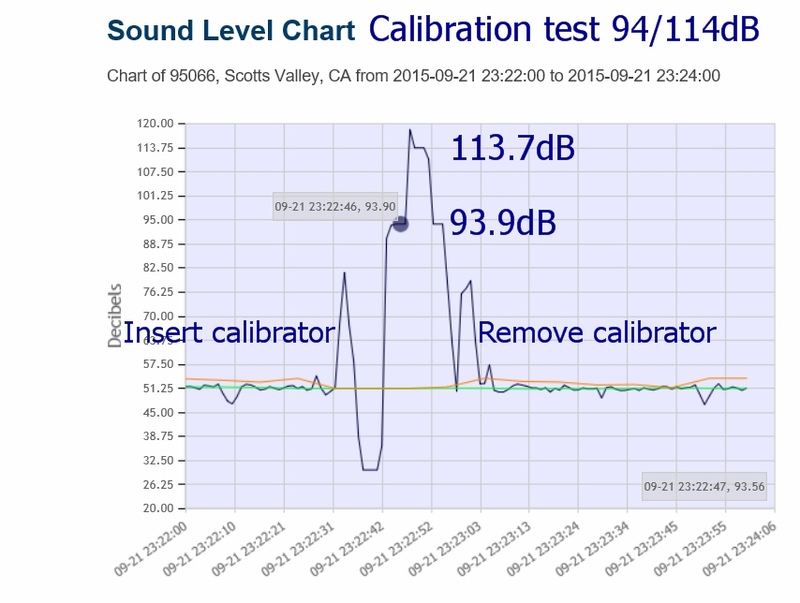 If it is just sound levels, how can it tell the difference between a jet and truck noise? Everything it detects is sent to the server. There, analysis software can determine whether the levels represent aircraft noise, or other impulse noise by the pattern of the levels. Noises that are too short or too long are rejected, and the shape of the noise pattern has to conform with known over flight patterns. Can it be left outside year round? No. With protective bags, the system can be left out in the rain, although in heavy rains, the rain noise will make for degraded noise readings. The main problem is temperature extremes. It is rated from 28F to 105F, so long as it remains powered. Temperatures outside of this range will likely damage the equipment. If the outside temperatures fall outside of the rated range, the system needs to be brought inside for its protection. This does mean that in places where it gets very cold, noise monitoring cannot be done at this price point. What if it breaks. Is there a warranty? No. This is an as-is situation. We each have to take care to not subject the noise monitor to extremes, and we each need to take part in and support its maintenance. I can probably get replacements for early failures (30 days), but highly unlikely afterward. To be candid, if you are unwilling to accept these risks, it is best to not get this noise monitor. Instead, invest in one of the $4000 systems. I have a site on my property for a noise monitor. Can you place one there? Indeed I can place one at your site, but because there is no slush fund or grant money, we all have to share in the costs. 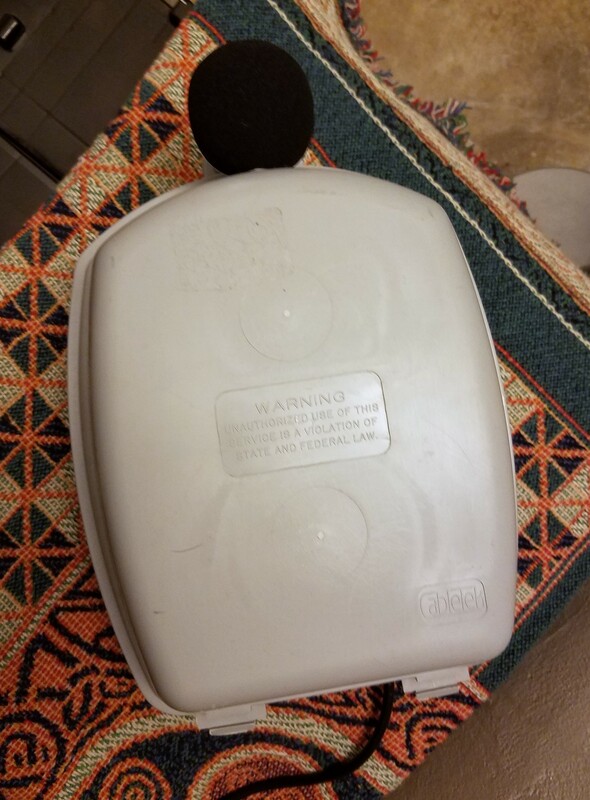 The unit is designed to be fairly inexpensive, and I need people who want a noise monitor to pay for its cost. I incur no profit on this. 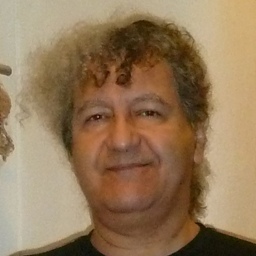 I presently pay for the WEB site and database storage costs. Is it possible to get outside funding for this project? Yes. If you have leads on that, let me know! I have six monitors up, presently in places where we can test them thoroughly before full deployment happens. They have now undergone the heat test since several of them were exposed to the last few days of 100F temperatures. Also, we found a problem with the units losing connection on occasion. That problem has been fixed. Have a look at the charts. Click here to see an example of the data collected. Select 95066, Scotts Valley then click on the Last 15 button to display the last 15 minutes of noise data in real time. To everyone who contacted me about the noise monitor, and your willingness to fund one, thank you very much. This is all a grass roots project. It is crowd funded, basically, everyone pays for a small piece of it, and it helps us all bring pressure on the FAA to make them undo the terrible noise they have unleashed over our homes. The goal of this system is to provide wide coverage of the huge noise problem the FAA has foisted on us all. Indeed this is a nationwide problem. This is not something that will happen overnight, as the FAA is extremely uncooperative and unwilling to make any substantive changes. Having solid noise and sound level data will give us a tool to help us galvanize our politicians, to help advocacy groups, and even to help with legal action should we get to that point. In this blog I have more on the price of the noise monitor, what it does, and how it can help reduce your reporting burden. Three of us have been conducting a month long test run of the noise monitor. It looks very good so far. I have a few changes to make to help protect it against the elements, notably rain, and I need to get a more ruggedized power adapter. I should be ready to make these available in 2-3 weeks time (mid September). The price will be approximately $165. The price varies depending on quantity and availability. Please send no money, until I ask. When ready, I or someone else will visit your place and find a good spot to set it up. At the last Save Our Skies Santa Cruz meeting a week ago, I discussed the networked noise monitor and logger system I am deploying throughout various parts of the country. I call it the Citizens Noise Monitoring system. This WEB site is part of that system. This project started out local to Santa Cruz, but through the spirit of cooperation it is beginning to spread. 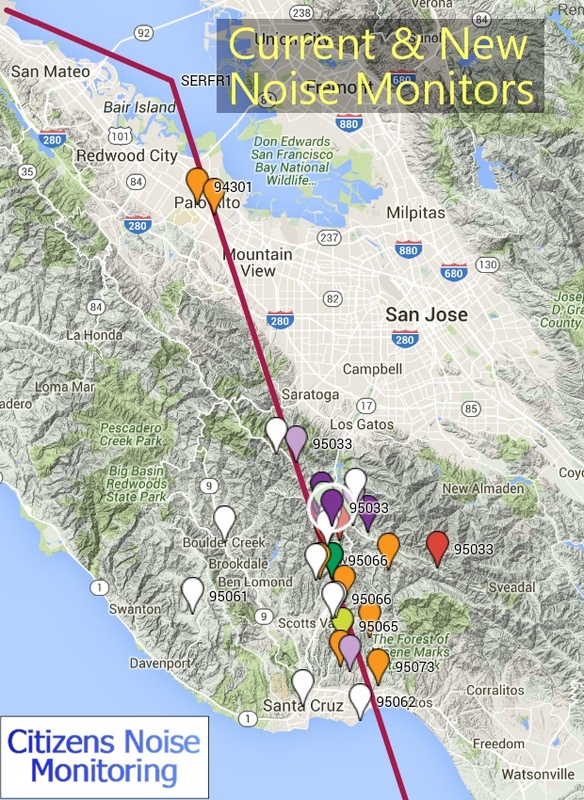 There is networked logger in Cambridge, and Belmont Massachusetts, and another one in north Scotts Valley. I have requests pending to deploy another thirty throughout Santa Cruz county, Palo Alto, and the Boston area.. I designed and developed it after it became clear we need hard data coupled with complaints to disprove a decades old noise analysis model that the FAA uses to dismiss complaints. The system is a commercially sold sound level meter (built to NIST type-2 standards) that is connected to a small microcomputer. It records the sound pressure levels, one reading each second 24 hours a day, 7 days a week, and then sends the readings to a central server for analysis. Click here to see an example of one the charts that can be produced. 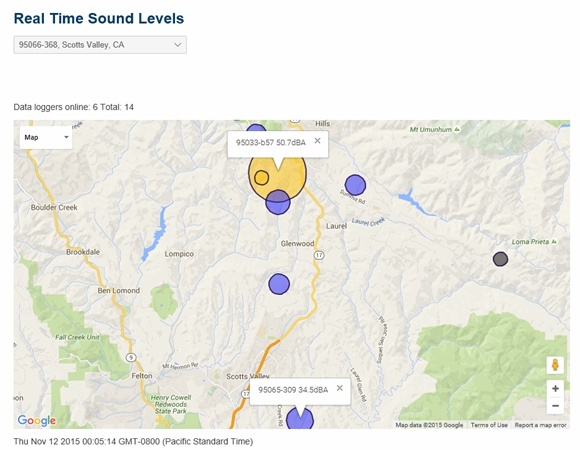 Select 95066, Scotts Valley then click on the Last 15 button to display the last 15 minutes of noise data in real time. What will also be available to people who host a noise monitor is a disturbance list that is generated from the collected noise readings. 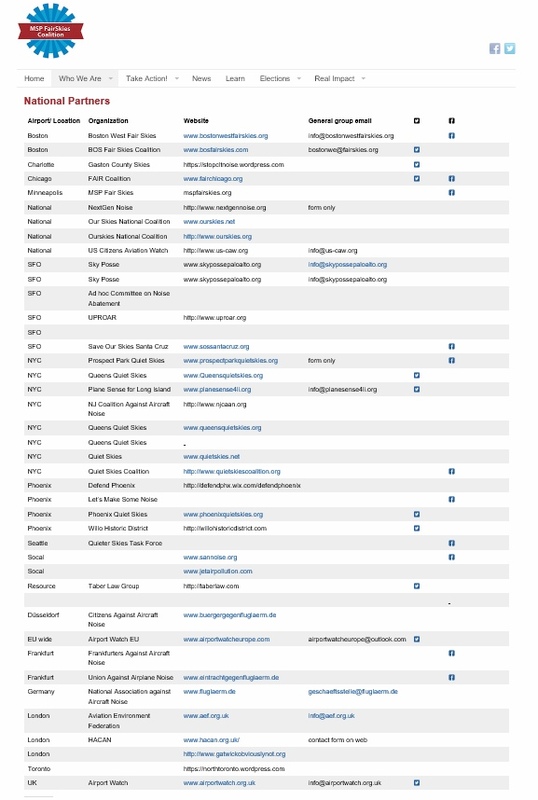 You will be able to copy then paste that list to your complaint emails. I went to Rep. Sam Farr's town hall meeting last night. There is movement he says, but we need to keep complaining. It is getting recognized as a national problem. You can read more about the meeting by clicking here. I am almost done connecting the chart maker to the noise database. It's going to be quite nice to select by area, then by a range of time or by trigger levels. 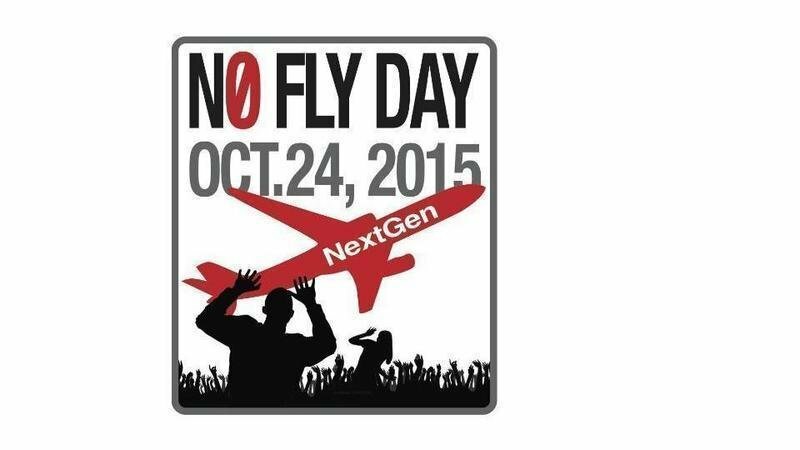 Sign the pledge today for national no-fly day, which takes places October 24th. Give the FAA and the airlines the message that we are not putting up with the massive noise increases the created when they implemented NextGen. Go here to sign the pledge. The initial WEB site pages are finally done. Took a while to get the template done, but definitely got a good head start using the open design template factory.